The Amaya Gaming Group has just completed the purchase of PokerStars & Full Tilt Poker for an aggregate purchase price of $4.9 billion. The successful acquisition has now created the worlds largest publicly traded online gambling company surpassing bwin.party. Amaya can be found under the following symbol (TSX: AYA) and as of press time has a market cap of $2.7 billion. We are extremely pleased to have completed this Acquisition. Through PokerStars, Full Tilt and its multiple live poker tours and events, Rational’s brands comprise the world’s largest poker business, generating diversified and recurring revenues across the globe from its extremely loyal customer base. Rational’s success is attributable to the company’s core values of integrity, customer focus, and challenge. These values are ingrained in the DNA of the company’s staff located across the globe, led by Rational’s deep, experienced executive and leadership teams. We intend for Rational to maintain this culture and will support its initiatives to continue growing this world class business. Since launching PokerStars in 2001 we have grown the business each year thanks to constant innovation, unparalleled customer service, and the talent of our dedicated workforce. While myself and other founders are departing, we are happy to see the business and the brands we have developed, along with the teams behind them, transferred to strong new ownership. I’m confident that Amaya, together with Rational Group’s leadership, will continue to successfully grow the business into the future. Anyone looking for the entire press release can view it here. For additional coverage of the acquisition can be found here. 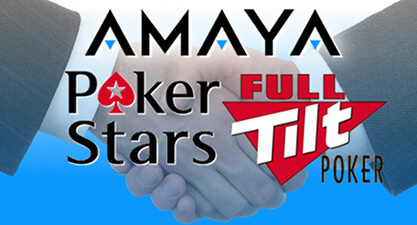 Players looking for more information about the two brands joining Amaya can go to PokerStars & Full Tilt Poker to learn more.